Last week we breathed new life into our Texas Fish & Game Instagram feed. We completely reworked our feed and our followers to primarily support our readers. Starting in December we will begin to post all of our Big Bags and Catches Photo Contest entries to our Instagram feed. We will continue to post entries to FishGame.com, but our Instagram feed will be a great place to check out all the great photos that we receive on a weekly basis. We have also added a space in the Big Bags and Catches entry form for you to input you Instagram user name. If you choose to provide your username we will tag you in your photo submission! In addition to Big Bags and Catches, the TF&G Instagram feed will give a readers a look behind the scenes with exclusive video shoot content as well as photos from our journeys into the great outdoors. 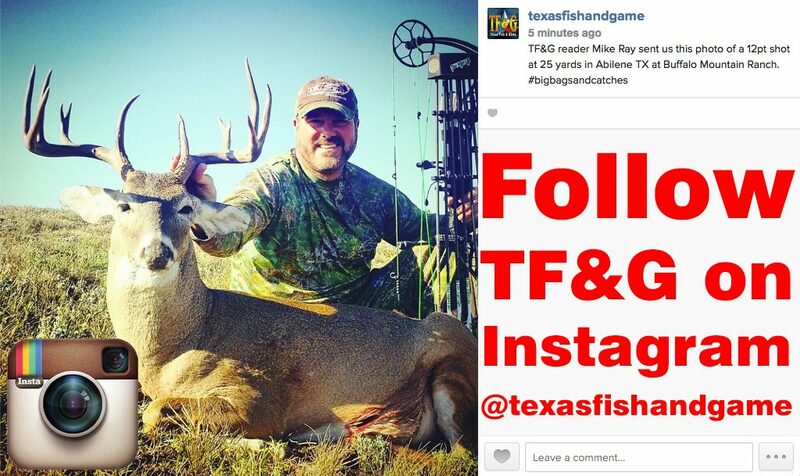 Simply search for “texasfishandgame” on Instagram and you will find us! You can check out our feed in you browser by clicking here.